It seems Sly and Millennium/Nu-Image are! Movie Hole is reporting that Sylvester Stallone will be returning to the Rambo series by next year! Stallone has apparently already finished the script for Rambo 5 and will begin shooting next year in Bulgaria. The film will be set in the U.S. (nice that they are shooting in Bulgaria) and will not be a war feature, but instead will be much closer to the original film as a action thriller. That's not all, Millennium/Nu-Image want one more to follow Rambo 5 and so does Sly! Apparently Sly will be moving forward with the another script for the sixth film in the series. The best part of all is Sly will direct both 5 and 6! 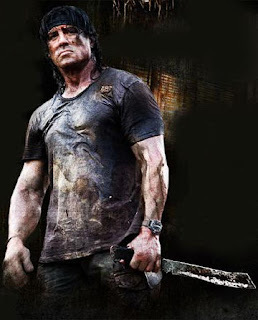 Stallone did a awesome job with both Rocky Balboa and Rambo, it is nice to see Sly taking control of his films. Its looking like Stallone will just continue to write and direct for himself in feature films for the foreseeable future. Fine by me, more to come on Rambo as it comes in.